Wasps did a fine job consolidating their place in the top four and remain very much in the hunt for a home semi-final after beating Northampton. It could prove a costly defeat for Saints, as they remain four points adrift of Leicester in the last remaining play-off sport with three games remaining. Next up in the Premiership, however, is a season-defining clash with the very Leicester side they are trying to leapfrog. Next week, attention turns to Europe for many Premiership clubs. For now, is goodbye from us. Thanks, as ever, for following the action here on the BBC Sport website. Rob Miller scored two tries as Wasps beat Northampton to boost their top-four hopes while also sealing leaders Saracens' place in the play-offs. Miller's converted try and a Jimmy Gopperth penalty put Wasps 10-3 up at the break after Saints' Stephen Myler kicked the first points of the game. Myler swapped penalties with Elliot Daly before Miller grabbed his second. Daly's long-range penalty and Jamie Stevenson's try ensured Wasps moved to within two points of second place. 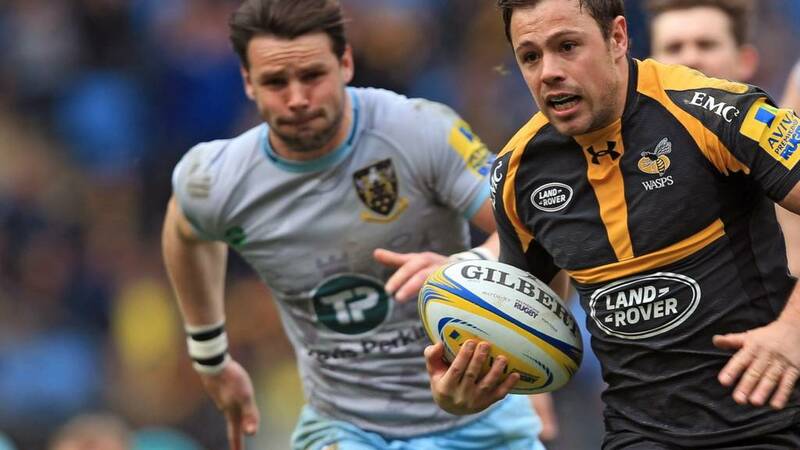 Wasps are now seven points clear of fourth-placed Leicester Tigers, while Northampton remain fifth. Wasps' two-try hero Rob Miller told BT Sport: "We were not at our best and we had to slog out a victory. But at this stage of the season we will take that. The win will really lift the energy in the camp." Wasps are almost certainly into the play-offs with a resounding win that was sealed in the latter stages. Saints who remain fifth, had plenty of good territory but their handling was simply not up to scratch at the vital moments. They face fourth-placed Leicester next weekend. As if that humdinger of a derby needed any extra spice. Replacement Wasps scrum-half Jamie Stevenson bundles over from close range for his first Wasps try and Wasps just about have enough time to get the bonus-point win. Perfect. Another long-distance effort from Elliot Daly sails over and that's job done. Just four minutes left now. Elliot Daly fancies a kick from his own half. This would surely wrap up victory for Wasps. There doesn't seem to be a sting in the tail here. It's all Wasps but they have not made their pressure count and Saints start to throw the ball out under their own posts. They visitors need real adventure to get back into this. Wasps looking to put this game well and truly out of reach now. Jimmy Gopperth finds Christian Wade, whose blistering burst is halted. When play is recycled Rob Miller is so nearly in for his hat-trick try on the right. Saints are still have a glimmer of hope as we enter the final 10 minutes. Is that game over? Great interplay between Craig Hampson and George Smith frees up space for Rob Miller. Miller runs a brilliant angle to charge over the line and, with the extras added by Jimmy Gopperth, the lead is now 14 points. A sensational charge by Nathan Hughes who storms out of defence, punts clear giving Christian Wade the chance to put pressure on Saints. It works and Wasps win the penalty and kick for the corner. Another promising moment comes to nothing for Saints. Ben Foden and Courtney Lawes combine out wide on the right but Foden fumbles trying to take an inside pass and Wasps can breathe again. It's not a head injury assessment for Lee Dickson, but he will play no further part. We restart play and are into the final 17 minutes. Just one converted try in the game. Wasps' Elliot Daly tackles Lee Dickson as he scrambles for possession on the deck and the Saints man is being assessed for a head injury. There's a bit of delay. He's walking off the pitch and will be replaced while he is checked out further. Another monumental kick from Wasps centre Elliot Daly, but this time it's just shy. As you were. Defences still very much on top. Lots of puffed-out cheeks and exasperated looks but not a lot of quality when it really counts. The game has been bubbling under all afternoon. It's just not quite boiled over. Yet. A quick Saints penalty leads to nothing. Good ambition and smart thinking from the visitors but once again it's sloppy handling and the ball rolls out of play. Scrappy. Rob Miller takes a great catch under pressure from another Stephen Myler skier. Wasps have looked good under the high ball today. There will no doubt be more tests to come though. Christian Wade looks groggy and would probably say it was, but Wade was going down as Harry Mallinder came flying in and it's just a penalty for Wasps. No yellow card. Is that a swinging arm from Harry Mallinder on Christian Wade? The tv match official wants another look.